When I was a first grade teacher in California, a group of us put together a month long social studies unit on Christmas Around the World. It's bit of a misnomer really, because Christmas Around the World was really a unit on celebrations in Europe, North America and some information about Hanukkah. But misnomer, or not, it was a big hit with the first graders, and I learned to associate the customs of other countries with my own holiday celebrations. The two charges are especially anxious to celebrate Christmas throughout the entire month of December. This month, I'll tell you a little bit about the traditions that we associate with the various countries, as well as leave you a recipe or food idea to compliment our studies. This year, it has particular meaning for me, with my European travels so fresh in my mind. First stop on our Christmas celebration is jolly old England. England was the first country to send Christmas Cards, so you have England to thank for your full mailbox this season. (Although, I suspect the catalogue companies have more to do with that.) Many of our Christmas Carols come from England, such as Holly and the Ivy, Deck the Halls, and God Rest ye Merry Gentlemen. Also, Dickens wrote a new testament for children, carefully guarded during his lifetime and even during the lifetime of his children. The Life of our Lord, which was not published until 1933, tells the story of the birth of Christ in a tender and touching manner, with very simple accessible writing. All of these Dicken' offerings will cost you no more than an hour or two to read, and his writing embodies all of the ideals of the season: peace, kindness, mercy, and charity for all. And between reading Dickens, writing Christmas cards, and listening to carols, you may get a wee bit hungry. You could always have a cup of tea and a scone, but some homemade English Toffee would also be perfectly in line with the season. Money Saving Tips: Save the pricey nuts for the top of the toffee where they'll have the added benefit of a beautiful presentation. Don't try to use margarine here-it won't work, but you don't need an expensive butter either. I've used Walmart, Albertsons, and Costco brands with good results. Notes: My cooking contest friend and toffee champion, Ruth Kendrick, just had her award winning recipe published in the food section of the Deseret News. She recommends cooking the butter and sugar over low heat until the sugar is completely dissolved. I tried her technique with this batch and it worked perfectly! Thanks, Ruth! Lightly coat an 8 by 8 inch pan with cooking spray. Melt butter in medium saucepan over low heat. Add sugar and water and stir constantly until butter is melted and sugar is completely dissolved and no longer grainy (about 10 minutes). If sugar granules stick to the side, wipe them down with a wet pastry brush. When sugar is completely dissolved, turn the heat up to medium and stir constantly until toffee becomes a medium caramel color. (I don't use a candy thermometer, but just go by the look and smell. Ruth recommends waiting till the toffee gives a puff of smoke. I did that yesterday and it worked like a charm.) Remove from heat and stir in vanilla. Pour toffee into prepared pan. Wait 7 minutes. Sprinkle toffee with chocolate and let stand a few minutes. Smooth chocolate with spatula and sprinkle with nuts. Wait until chocolate cools to break into pieces. Leave your shoes out tonight (Dec. 5) for Sinter Klaas! Wow, that toffee looks so good. Those nuts sprinkled on top make it irresistible to me. Loved your quote from Charles Dickens. I can't wait to read the Christmas Carol especially on a Snowy night. Thanks again for another great recipe! I just told my kids out Sinter Klaas last night! They are so excited. The toffee looks delightful...can't wait. I love toffee! I am not that great at making it but my Mutti is a pro! In fact she makes it in her science class each year to demonstrate changes in matter! (Solid, to liquid to solid etc.) Yum-E! I am so ready to do some holiday baking! Way to start'er out Prudy! Toffee is one of my favorites this time of year. A real holiday treat. I've never made my own toffee. This might be the year to try some new things. I just fall back on the old standards. Can't wait to read more about the traditions you celebrated from around the world, with the class!! That toffee looks delicious! I love "The Life of Our Dear Lord." I read it to my kids last year, they didn't love it, but hopefully someday they will! What a fun post :). A Christmas Carol is always a favorite of mine, year-around. Definitely an affordable Christmas gift! I'm going to try to bake/cook as many of my Christmas gifts this year as possible, hopefully they come out this tasty :D.
Toffee is my favorite!! I love the nuts on top! So interesting! And both of those cards are so classic. I want them! The toffee sounds yummy as well. Thank you for choosing toffee rather than Christmas Pudding! Also, I have a little soiree tomorrow night and need to make something festive and EASY...and desperately need your help! If you don't help I'll end up making green rice crispy treats with red hots! Help! We were just talking about that toffee article yesterday. Can't wait to try this out. I really enjoy your book recommendations. I have the feeling if we meet, we will be kindred spirits! What a wonderful treat for your family to be able to celebrate Christmas around the world. Can't wait to see what is up your sleeve for Holland- that is where my dad served his mission. Excited to see and read about Christmas around the world. My mom is from Mexico so a lot of our traditions as kids involved those from Mexico especially the religious ones. So, last year I bought my son two books detailing some of the Mexican Christmas traditions. He's had me read it to him several times and he loves it because it involves singing. He enjoys hearing me sing and enjoys learning the songs as well. I've never made toffee before, but yours looks so wonderful I may have to give it a try. It would be a nice gift for some of the people on my list! Gorgeous, as usual. I can't wait to see what's next! I love the quote from Dickens! We're going to a Dickens Christmas celebration tommorow night! Erin, the toffee looks so good. I'd love to pick up, pack up and disappear. I love Charles Dickens book, The Life of Our Lord. It is written so well and is full of kindness. I am always amazed more people are not familar with it. Mom has always seemed to instinctively know what books are worth reading, sharing and saving. Also, I bought 3 Christmas Carols with illustrations by Quentin Blake in London and gave them away as gifts, only to come home to find out that they are a rarity here and a collectors item! A used copy was $50. I just love to read your blog. How creative to celebrate Christmas around the World with your kids. I just might surprise my kids with something in their shoes tomorrow! The toffee looks amazing. I've never tried making toffee before. Maybe this will be the year. Thanks for the tips! I LOVE English toffee - I need to make some of this! How many calories did I pick up from this after licking my screen? Maybe we'll leave Mom's clogs out for Sinter Claas, since they're a darn sight cleaner than the boys' footgear! Oh, I can already tell that I am going to LOVE your "Christmas Around the World" series! I totally remember the "Christmas Around the World" lessons from when I was in elementary school; I was captivated! I think that the Christmas that many of us envision is based on the English Victorian Chirstmas. And the toffee looks delicious!! We do a Christmas Around the World in 2nd grade at the school and the kids love it! That toffee looks so wonderful! English toffee is my favorite christmas treat. I love the way you put the nuts on the top in larger pieces. It is so pretty. I am going to make this recipe soon! Thanks Prudie! Ha ha ha, great minds think alike! I made toffee last week! We'll be setting our shoes out on the hearth tonight (we celebrate St. Nicholas Day as my grandmother is a German immigrant)! I just bought some toffee today, and it doidn't look as good as yours, at all! Nice series you started, I'll be back for more! The toffee looks sooo good! I love toffee....I just can't eat it right now (process of a root canal). That toffee looks wonderful Erin!!! I love English toffee,and of course I get to eat it all the time if I want to over here, but I bet homemade is infinitely better! 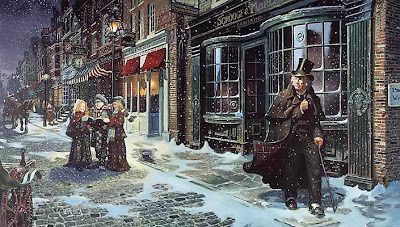 We live not too far from Dicken's world and I am hoping that we will be able to make a trip there over the holidays so that we can experience a real Dickensian Christmas! I loved the Christmas around the World lesson. I suddenly feel smarter! Your toffee looks so tasty - another thing to add to my Christmas baking list! Hoorey! Someone else who makes their own toffee. Looks Beautimus. Don't you just love the snap of the toffee? me too! Happy holidays and thanks for the neat post! Love the toffee recipe! And thanks for the stories. I have the book "A Christmas Carol" on my coffee table right now. I can't wait to read more posts about Christmas around the world. Oh these look wonderful!! I love English Toffee ;) Sorry I haven't been around commenting, but I have been looking! I've been overloaded with work. I fell behind with TWD and everything. Getting back on track now I hope! Hope to see you join the Cooking with Alicia & Annie blog event this month! I just loved reading this post...so festive! Brings back memories. Your kids are very lucky to have you teach them all these wonderful holidays events. And toffee to boot! Oh I can't wait for all the information. This toffee looks like a perfect treat for the boys. Oh this is such a great series you are doing. I look forward to the next installment. pretty toffee. I've been guilty of eating a full box in one sitting. my brother's ex gf, used to gift a big tin box to all the married women in the family! Love that stuff! The toffee looks great! I'm featuring Christmas recipes this week. Do you mind if I use your photo and a link to your blog? I love toffee! Thanks for a great delivery system recipe. the toffee looks wonderful! 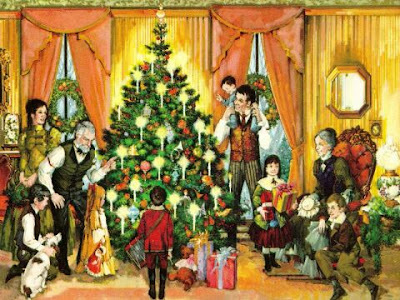 I am a huge Dickens fan- I read a bunch of his Christmas stories for an independent study but A Christmas Carol is my absolute favorite! I never tire of reading it!